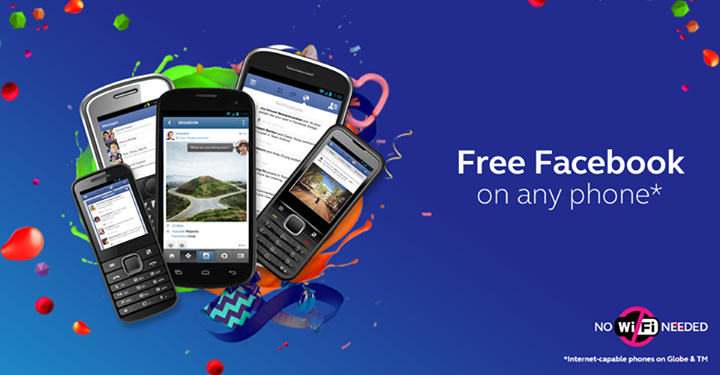 Globe Telecom has announced that it will extend its “Free Facebook” promotion until May 15, 2015. This is in line with the signed agreement with the leading social media app to make internet.org available to all Globe customers. For the past two years, Globe has had incredible success working closely with Facebook to increase internet usage in the Philippines, through its "Free Facebook" offer on mobile. According to Globe Senior Advisor for Consumer Business Group Daniel Horan, the telco’s "Free Facebook" offer has propelled mobile data customer growth of 120%, increasing mobile internet users by 6 million Filipinos. “Our partnership with Facebook and the learnings from our successful ‘free FB’ campaigns have helped drive heightened awareness and interest about the Globe-Internet.org proposition. As such, this key partnership has led us to become the leader in creating a digital lifestyle for Filipinos, as evidenced by our 64% revenue market share in the Filipinos mobile data market. This clearly puts Globe in a unique position as the preferred mobile brand in the Philippines,” said Horan. True to the telco’s commitment to its customers, he happily announces that the highly successful and first-in-market "Free Facebook" offer with any promo purchase will be extended until May 15, 2015, allowing its 46 million mobile customer base to enjoy the full Facebook experience. Mindful of another important customer segment who have yet to get on mobile internet, Globe is equally just as excited to share the good news on the launch of internet.org, which is Facebook founder Mark Zuckerberg's worldwide initiative on driving internet usage. “The forthcoming landmark collaboration of Globe with internet.org will further encourage first time Filipinos Internet users to discover the power of the Web. This is indicative of our paramount role in leading them into the worldwide movement online through their Globe-powered digital lifestyle,” added Horan. He said that the upcoming Globe-Internet.org partnership would serve as the company’s impetus to launch new and exciting offers and make mobile internet more accessible within a safe browsing environment for Globe customers, without having to worry about unexpected charges. With regard to the internet.org functionalities and content inclusions that will be made available to its base, Globe says it will be keeping launch details close to its chest and may yet spring a wonderful surprise for its customers. As a leader in innovation, Globe is known for giving a differentiated user experience compared to competition. Globe and Facebook came out with a recent whitepaper on global internet adoption, the details of which can be viewed through this LINK.